Technological innovation brings great opportunity for improving results and our quality of life. But transforming potential benefits into real results comes with many challenges. For many years GMs huge investment in robotics in the 1980s ($billions) has been an example of how pinning hopes on technology often doesn’t produce the desired results. I think that a capable management system is needed to make technological innovation as successful as it needs to be. In this decade we are finally reaching the point where robotics is really making incredible strides. Robotics has provided huge benefits for decades, when used appropriately, but the ease of use and benefits from robotics have greatly increased recently. 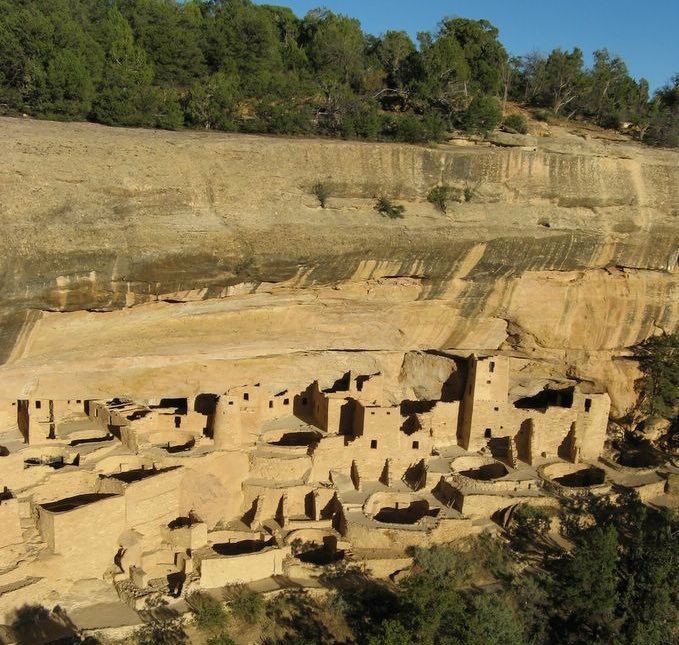 Photo by John Hunter of Cliff Palace (built in the 1190s), Mesa Verde National Park. I am less confident in the Internet of Things. It seems to me that much of the IoT effort currently is flailing around in ways similar to GMs approach to robotics in the 1980s and 1990s. There is huge potential for IoT but the architecture of those solutions and the impact of that architecture on security (and fragile software that creates many more problems than it solves) is not being approached wisely in my opinion. IoT efforts should focus on delivering robust solutions in the areas where there is a clear benefit to adopting IoT solutions. And that needs to be done with an understanding of security and the lifecycle of the devices and businesses. I think it will be much wiser to have an internet hub in the business or home that has all IoT traffic route through it in a very clear and visible way. Users need clear ways to know what the IoT is trying to do and to have control to determine what is and what is not sent out from their system. Having devices that share information in a non-transparent way is not wise. This is especially when those devices have cameras or microphones. The technology used in these devices has time and again proven to be very insecure: A TV That Doesn’t Spy on You?. And spying on users by manufacturers has been far too common for it to be wise to use any IoT that doesn’t have transparent view of what data is being shared with an easy to use interface to block what you don’t want to share. But these customer protections are rare, so IoT has a critical flaw that means it needs a great deal of work before wise people should consider using most devices touting IoT features. Big data has big potential and is being used to do amazing things already. But it is much more difficult to use big data effectively than people hope. Companies with very skilled people can craft their own big data driven innovations (related: Does the Data Deluge Make the Scientific Method Obsolete? No.). Most organizations however it seems to me are taken with the idea but do not have near the understanding of data needed to do more than accept analysis provided by systems (designed by those companies with the talent to create them) or consultants. Doing this can still provide benefits but it is a risky option, when you are essentially trusting other people to draw conclusions from data that you can’t really critically question (because it is beyond your ability to understand). Even the very best companies get tripped up trying to use big data to improve. To grow the capability of more organizations to safely use big data we need the same efforts needed to have them effectively use data. We continue to make progress in improving the understanding and use of data in organization but it is slow and there is much more misuse and misunderstanding than there is proper use and accurate understanding of what conclusions can and cannot be drawn from data. My guess is big data benefits will largely flow to a handful of organization (Amazon, Google, etc.) for the next few decades. Most organizations will participate by using tools or analysis provided by experts. That will provide benefits but it will also result in many instances of misusing big data. Artificial intelligence continues to hold great potential and the last 5 years really seems to show some amazing breakthroughs. Again the rewards for artificial intelligence innovation will likely flow to a few companies (IBM, Google, Apple…). It will be interesting to see if IBM can profitable implement Watson solutions. Watson seems to be a powerful implementation of AI. But IBM does not seem to be nearly as successfully making a business out of it as they should be. The benefits from these technological innovations will create great economic benefit to society. For example, in AI Watson has potential to do great things in health care. If IBM can manage this successfully they should make many billions of dollars. And those customers they serve (hospitals, doctors, healthcare providers etc.) should be able to great improve their ability to provide healthcare solutions based on these efforts. Turning technology into business success however will rest upon strong management systems that understand what data does and does not indicate, systems thinking, etc.. The need for a strong management improvement system is even more critical with these fourth industrial revolution technologies than it has been previously. The progress on improvement management practices remains far to slow. I worry that much of the potential benefit from these new tools will be wasted by organizations that are not able to effectively take advantage of these new tools (the overlap with those organizations that fail to use data properly today will be large). Many of those organizations will passively see these new tools as saviors that allow them to avoid making the necessary improvements to their management thinking and management systems. I fear that hope will fair as badly as GM’s investment in robotics in the 1980s fared. 3D printing is another aspect of the 4th industrial revolution. It is already a powerful force and the impact on the economy is going to grow rapidly (3D Printing at Home: Today, Challenges and Opportunities). One of the aspects of management that all of these innovations make more important is the ability for organizations to rapidly adjust to drastic changes in the market and competitive landscape. Organizations need to be designed to be robust and to cope well with the increasingly rapid pace of transformative innovation. This again reinforces the importance of management improvement practices that I have been writing about here (on the Curious Cat Management Improvement blog) for more than 10 years. Organizations that do not delight customers, know the jobs to be done that their customers have, focus on the future (long term thinking), understand how to use data, have well designed processes that allow those at the gemba to know what to do and know how to rapidly adjust based on new realities and possibilities are at great risk. * The day after this was posted Alphabet (Google) sold Boston Dynamics and another robotics company they owned to Softbank. Google had made it clear Boston Dynamics was for sale and as an incredibly innovative company I chose to list Boston Dynamics separately. And Softbank was probably not a company many people thought of as among the top handful of robotics companies, but it seemed to me they would be and their purchase of Boston Dynamics I think validates that belief. This entry was posted in Data, Innovation, Systems thinking and tagged ASQ Influential Voices, Data, Innovation, organization as a system, Systems thinking, technology on June 7, 2017 by John Hunter.